In case you missed last weekend’s Indy 500, here is a replay of the last few minutes of it. I was live tweeting while watching it on TV, and the lead changes were happening so fast that I actually could not finish typing a tweet before the lead would change two or three times. It was incredibly exciting. By now it’s probably not a spoiler to mention that Juan Pablo Montoya won the race, this being the second Indy500 win of his career. It was truly a fight to the finish. 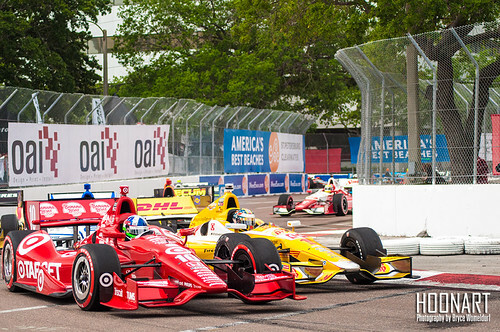 It is always exciting this time of year when the Honda Grand Prix takes over the streets of St Pete, but this year was especially thrilling, because I got to shoot as part of the photographer pool for the Grand Prix. This was closer than I’ve ever gotten to see the track, the drivers, the pit lane, and well… everything! 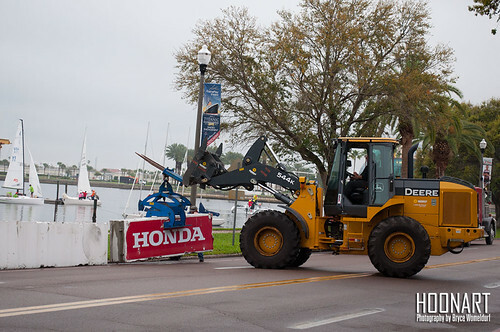 Early on Friday morning, I attended the beginning of the construction of the street course that is annually built on the streets of St Pete for the Honda Grand Prix.